McGruff wrote: I have a spare silicone hose and read if you out it on the bottom valve and tie it up near the recirculating arm, it will tell you your level when sparging. I will do it on my next brew session. Works great. Just remember if you are using a jacket or insulation on the RoboBrew you will need to transfer the volume markings as well. Just brewed up 15 Gallons of Pumpkin spiced Milk Stout for thanksgiving. I didn't leave enough head space and it blew my airlock all the way to the ceiling but settled out after a day. Today I'm brewing up an 80/- for the Decembeer Exchange. I'm hoping for a complex malt profile, but still a very drinkable beer. Starting early on the exchange! Must need a ton of conditioning. Looking forward to trying it. Thanks buddy! I'm really hoping for a clean finish, and properly carbed bottles. Mine is last on the list, so the bottles have at least 4 weeks before being cracked open. Any idea what you're making? Not exactly yet. I brewed a bunch of great beers the past few months so likely will pick one of those and brew it up again. Just doing my standard Pale this weekend as it ran out in the kegerator. Brewed a Pilsner and a Blonde Ale today. Brewed up my Scotian Dubbel yesterday, used the Scotian Sauvage yeast (Big Spruce Pin Cherry)...thanks to LiverDance for the yeast hookup! Graduating from 2.5 gallon and brewing a 5 gallon coconut stout with my first yeast starter. 8L of eggnog in a pin lock keg, charged with 40psi nitrogen. Leaving it in the fridge at work over the weekend and putting a stout tap on it on Monday. Head retention shouldn't be an issue at all. I'm expecting the creamiest beverage ever. Just finished an imperial red ale. Brewed a Blue Moon and a Guinness today. First go at a Porter for the December exchange. Hope you enjoy. Picked a heck of a day to brew a dunkles bock yesterday. Brewing a Rye Pale Ale for the exchange, should be tasty. Weird, in a good kind of way. Totally wasn't what I expected. I was expecting eggnog foam, and I think I got eggnog foam? 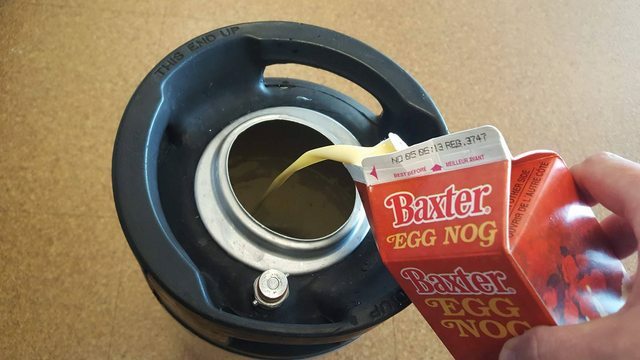 At first I didn't think it worked at all - I didn't get any foam out of the tap, just liquid - and I figured the eggnog just couldn't absorb nitrogen gas for some reason. But putting a glass of nitro eggnog beside a glass straight from the carton, the nitro stuff is lighter colored, creamer and tastes sweeter - It's like the nitrogen stays suspended in it instead of rising to the top and forming a head. I upped the pressure to 60psi to see what would happen... exact same result but even creamier/lighter in color. But shoot some of the nitro eggnog from the tap into a mug of coffee, the gas separates out and you get a beautiful head on your coffee. Brewed up my hefe for the Big Spruce comp last night.